The Pz.Kpfw. 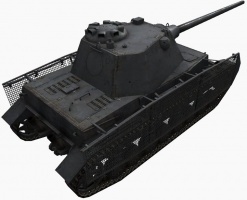 IV Schmalturm is a German tier 6 premium medium tank. In November 1944, the Krupp company presented several avant-projects aimed at upgrading the armament of tanks and tank destroyers in service. Among them there was a project for mounting the Panther's Schmalturm turret on the Pz IV Ausf. J. The project was not considered as it would overload the suspension and production of the Pz IV was being phased out. Combining the turret of the Panther and the hull of the Pz.Kpfw. IV Ausf. H, the Pz. IV S. has a more resilient turret than the other German medium tanks, excepting the VK 30.01 (P). It trades this for poorer hull armor and poor mobility. In earlier patches of World of Tanks when the game still had +/-3 matchmaking, the Tier V Pz. 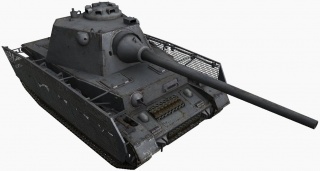 IV had the Schmalturm as its upgraded turret with the 7,5 cm Kw.K. 42 L/70 gun. When softer matchmaking rules were introduced, the Tier V tank lost the Schmalturm and the Pz. 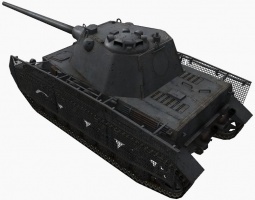 IV S. was reintroduced as a premium tank, now at Tier VI. The Pz. IV S. was removed from sale in the gift shop and the in game tech tree on the 8 June 2015 Removal of Premium Tanks From Shop as part of the WG retirement plan. The Pz. IV S. uses the same 7,5 cm L/70 gun as the other Tier VI German medium tanks, but with better dispersion parameters. With 150 mm of penetration with AP, the gun is quite adequate for most tanks it encounters at Tier VI (except the Churchill VII and O-I). However, it will struggle against Tier VIIIs, even with APCR sometimes. It is quite accurate and capable of hitting fairly consistently at medium to long ranges. The gun has a mediocre damage per shot, but the rate of fire is on par, though it would still lose in slugging matches against a few other high DPM tanks, like the M4A3E8 Sherman and Cromwell. 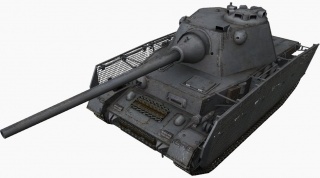 The Schmalturm turret is quite resilient against lower tier tanks, and the gun mantlet and angled turret sides can get ricochets when the turret is pointed directly facing incoming fire. However, the flat face of the turret is only 120 mm thick, and can be penetrated by even some Tier V tanks. This is a weakness common to all the higher tier German medium tanks in the E 50 line. The hull is very weakly armored by Tier VI medium tank standards, and the sides are only 30 mm thick. A large caliber HE shell to the side, even pre-detonated by the skirt, will usually hit hard. The sideskirts do count toward the armor model, but have minor effect on incoming kinetic projectiles. With a fairly weak engine, the Pz. IV S. has by far the worst mobility of the Tier VI German medium tanks. It does not accelerate very fast or turn very quickly. Combined with the glacial turret traverse rate, this makes the Pz. IV S. very vulnerable to getting flanked or circle, as it cannot respond quickly to being attacked from multiple angles. The Pz. IV S. excels at sniping from long ranges, using its accuracy and rate-of-fire to wear down its opponents. However, it will often find itself fighting at much closer ranges, which requires a lot of caution. It is generally best to avoid brawling in the Pz IV S. unless in a position where the weak hull can be hidden. The gun depression is enough to take advantage of terrain, making hulldown tactics somewhat viable. Given the growing resistance of allied tanks to German anti-tank guns, plans were developed to categorically up-gun the entire range of German tanks toward the end of World War II. One possible answer was affixing the Schmalturm of the Panther Ausf. F to the Panzerkampfwagen IV Ausf. J chassis. No prototype was ever built so only the drawing give an indication of what the conversion would look like. Unfortunately, like so many other late-war German projects, this conversion was impractical. The chassis of the Panzerkampfwagen IV was severely overloaded by the schmalturm. 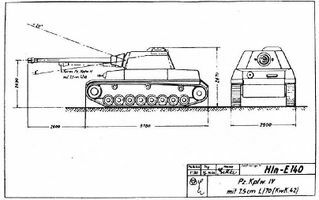 Furthermore, it is doubtful the turret ring of the Panzer IV would have been able to accommodate the turret unless the overhang was widened (which was suggested in one schematic). However this would have further overloaded an already burdened chassis. This page was last modified on 18 July 2018, at 04:49. This page has been accessed 262,141 times.